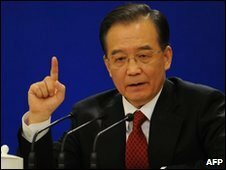 Chinese Premier Wen Jiabao has rejected criticism that China is keeping its currency undervalued in order to boost exports. He said keeping the yuan stable was "an important contribution" to global recovery from the economic downturn. He was speaking at the end of China's annual parliamentary session. Mr Wen also said that recent strains in ties with the US were Washington's fault, citing arms sales to Taiwan and a White House visit by the Dalai Lama. Speaking to reporters in Beijing, Mr Wen denied China's currency, the yuan, also known as the renminbi, was undervalued. US legislators and trade groups say the yuan is kept up to 40% below what its value should be against the US dollar. "I don't think the renminbi is undervalued," Mr Wen said at Sunday's news conference in the Great Hall of the People. "We oppose all countries engaging in mutual finger-pointing or taking strong measures to force other nations to appreciate their currencies." The yuan was tied to the dollar until 2005 when it was allowed to rise in value by about 20%. The peg was reinstated in 2008 when the global economic crisis cut demand for Chinese products and factories began closing. Asked about recent strains in relations with Washington, he said: "The responsibility for the serious disruption in US-China ties does not lie with the Chinese side, but with the US." In January Washington approved a $6.4bn (£4.2bn) arms sale to Taiwan that former President George W Bush had initiated. President Barack Obama then met Tibetan spiritual leader the Dalai Lama at the White House. Both moves "violated China's sovereignty," Mr Wen said. China considers the self-ruled Taiwan as part of its territory awaiting reunification. The premier also defended his country's role at the Copenhagen climate change conference last December. China was accused of standing in the way of a more ambitious agreement at the meeting. Mr Wen said his delegation continued working towards an agreement even when others had given up. He also rejected accusations that he had snubbed talks between top leaders - including Barack Obama - during the conference, saying China had not been notified of the meeting.